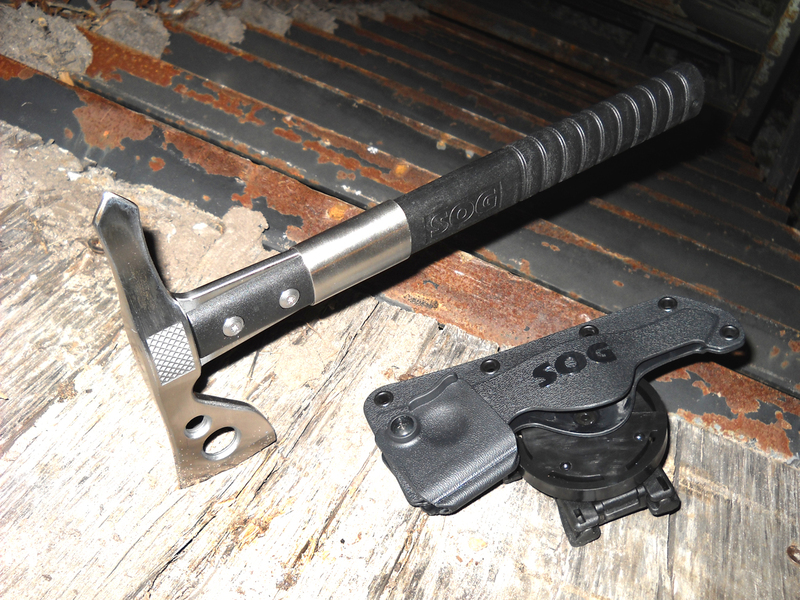 SOG Specialty Knives & Tool‘s FastHawk is a scaled down version of their popular Tactical Tomahawk. Light and easy to carry, I found the FastHawk to be a good compromise of size and functionality. At 12 ½” in length and only 19 ounces, it is a compact package. The FastHawk can be used to cut, chop, dig, pry, and hammer. I did these things during some late night T&E sessions. I started off with some chopping. That seemed reasonable. I attacked several discarded pallets. As a hand axe, the FastHawk worked it way through wood just fine. At home, I took it to my super-hard aged 2 X 4. Thunk, thunk, thunk! Wood chips were flying. I thought the FastHawk was weighted nicely. Despite a Rockwell Hardness of only 51-53, the 2” main blade, made of 420 stainless steel, holds a good edge. The lower hardness helps in its durability. This is not some expensive high-end hawk head that is differentially heat-treated, nor is it high carbon tool steel. This is a moderate stainless steel that is being pushed slightly out of its comfort zone. I found the blade stayed plenty sharp to cut and chop. Made of Fiberglass-Reinforced Nylon, the handle is ribbed and textured for a positive grip. My hands became very sweaty while I was chopping (80+ degrees with high humidity at night). I did not have a problem with the handle slipping. The FRN handle is very rigid and is attached to the head via a steel ferrule and heavy bolts. I had no worries about the integrity of the joint between the handle and head. There is a lanyard hole at the base of the handle. I hammered a couple of nails with the checkered flat at the side of the ‘hawk’s head. It is a little awkward with the oval handle sideways in your hand, but it did the job. For safety, I’d keep the bladed side of the head facing away from you. The spike side of the FastHawk’s head was pointy, but not sharp. I suppose you could touch it up with a file, but since its intended for general piercing, prying, and digging I’m leaving mine as is. There is enough mass behind the head to drive the spike into many things, such as wood, drywall, aluminum siding, and thin sheet metal. I can see that the spike side is useful for prying. 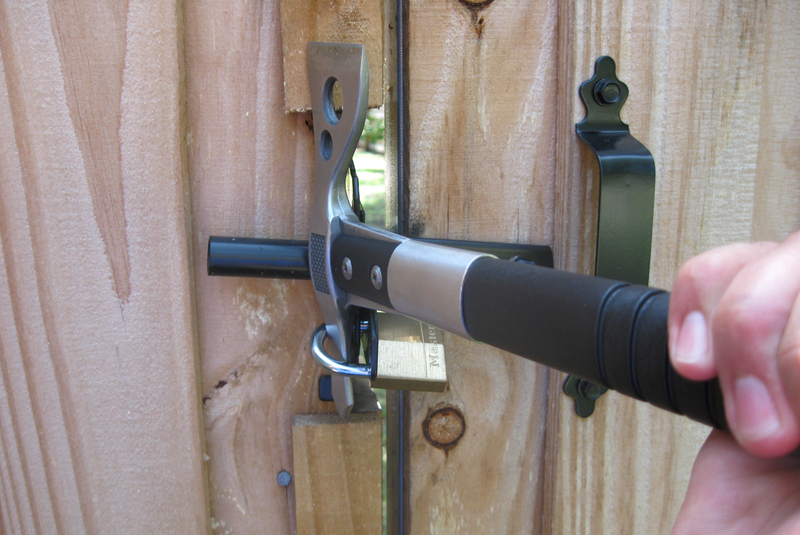 It can be inserted into a padlock to pry the hasp off a door or fence. When I was at SHOT Show in January, SOG Marketing Manager Chris Cashbaugh showed me their new hard nylon sheath for the FastHawk. The ‘hawk slides into the sheath spike first and locks upward. There is a rotating hood to secure the FastHawk and sheath. 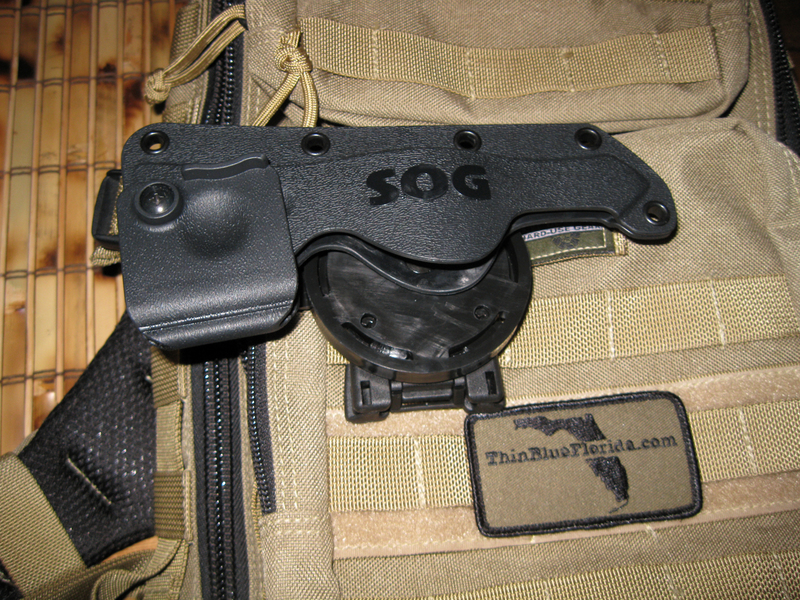 The sheath is mounted with a locking style belt loop/MOLLE clip. 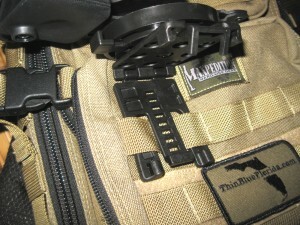 It will fit on belts up to 2 1/4” or on MOLLE or PALS webbing. The sheath has a detent button that allows it to be rotated 360 degrees. I like the versatility of being able to affixed the FastHawk to either load bearing vests or backpacks. 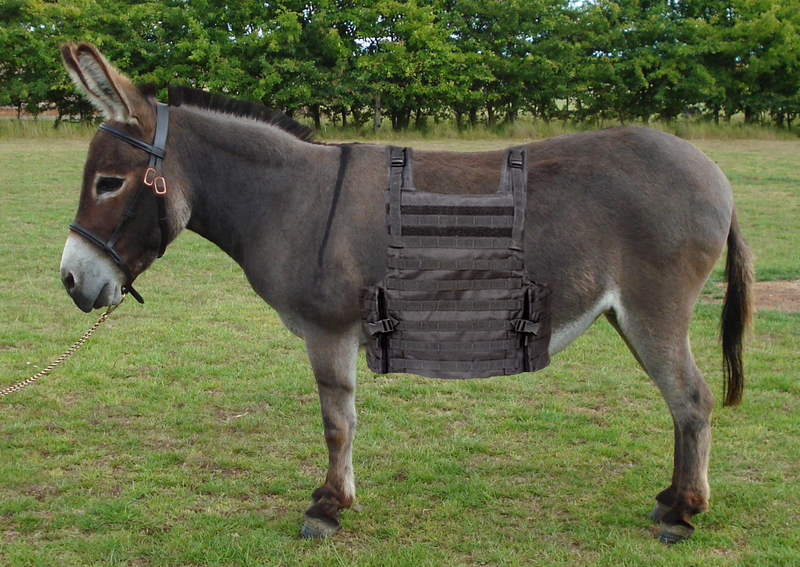 I mounted the sheath on the rear of my VooDoo patrol plate carrier. I discovered that I could rotate the FastHawk 90 degrees and unlimber it from the sheath without a problem. My FastHawk came as the polished version, though thankfully it has more of a brushed finish that a polish. There is also the “Hardcased” black coated version. In addition to the hard nylon sheath, mine shipped with the soft nylon belt sheath. The FastHawk has definite potential as an anti-personnel weapon in close combat. This is a very unique fighting form, using not only chops and strikes, but traps, catches, and blocks. Proficiency at tomahawk fighting requires training. 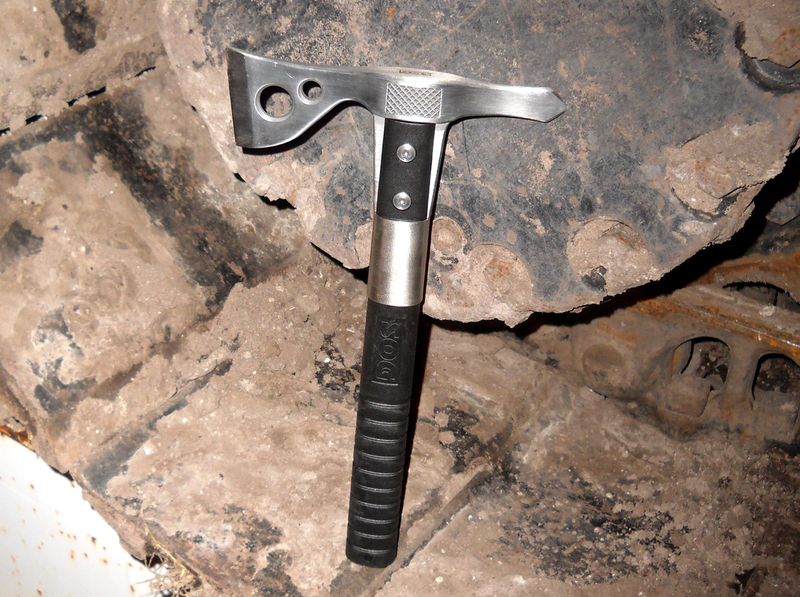 It is fitting that SOG Knives would begin making Tomahawks. 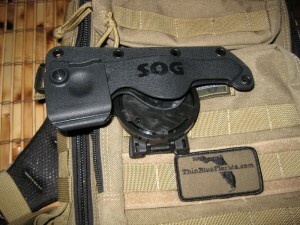 The SOG line started in 1986 with Spencer Frazer’s interpretation of the legendary Studies and Observation Group (SOG) military knife of the Vietnam era. That conflict also gave birth to Peter LaGana’s 1966 interpretation of the fighting ‘hawk, known simply as the Vietnam Tomahawk, to which the FastHawk and Tactical Tomahawk owe nods..
For an MSRP of $50, this is a great tool that is handy to carry on a vest, pack, back-up bag, or in a vehicle. 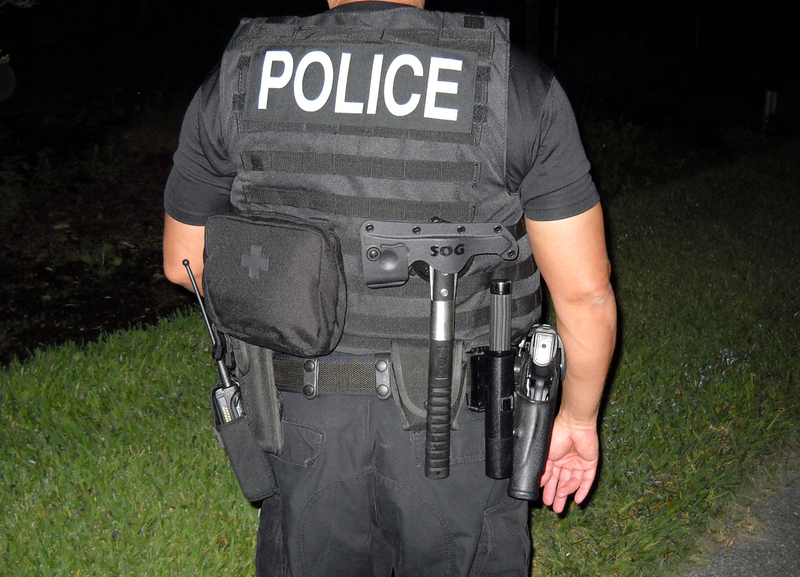 The FastHawk can find usefulness for SWAT or for patrol officers. I’ll definitely have this in my trunk now that it is Hurricane Season. I think I'll call her Molly. 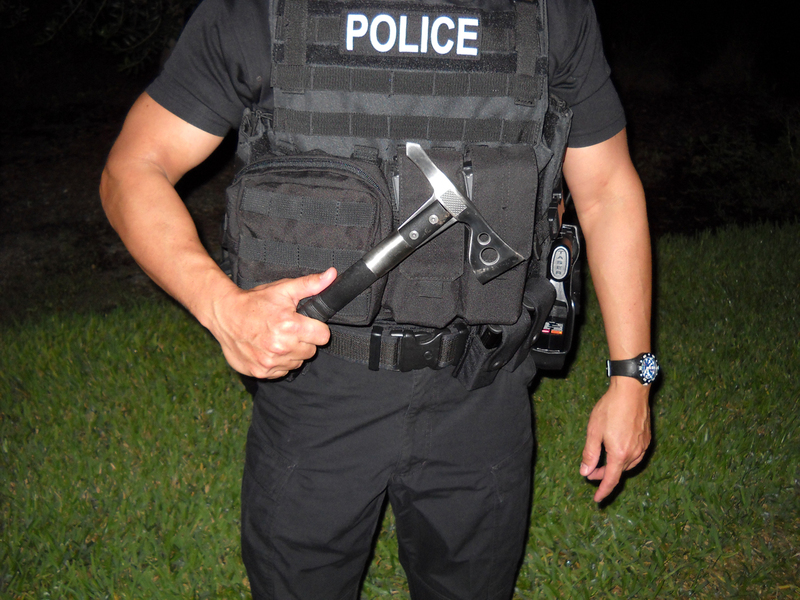 This entry was posted in Knives, SHOT Show and tagged FastHawk Review, Police Tomahawk, SOG Knives, SWAT Tomahawk, Tomahawk Review. Bookmark the permalink. Looks sweet! What is the name of clip you used to attach the hawk to your molle pack? It is a Tec-Loc-style clip and comes standard with the FastHawk’s hard nylon sheath. I recently purchased two of the SOG FastHawk Tomahawks from Midway great product and have ordered two of the hard nylon sheaths from amazon, really good price on these items. Did not care for the grip area on the FastHawks though so have modified the grips to better fit my large hand and to give better control during use. First I slipped 10 11/16″ I.D. x 7/8″ O.D. x 3/32″ thick O-Rings over the grip and into the grip grooves. Next if you want to use the lanyard hole place a wooden dowel in the lanyard hole so that approximately 1/4″ protrudes from each side of the grip and wrap wire around the head to hang your hawk while it is drying between coats. Next using Performix Plasti Dip, black, and following the directions on the back of the can immerse the grip in the plasti dip as many times as it takes to get the griping surface that is right for you, I used four coats, after drying , directions recommend four hours I let it dry overnight, I trimmed the plasti dip around dowel on both sides of the grip and removed the dowel leaving the lanyard hole clear of the dip and free to use if I so desire. Performix Plasti Dip multi-purpose rubber coating is available from most hardware stores. I hope this information is of use to others who are having a problem with the grip on there Hawk as I was. And good chopping and ripping to one and all. Thanks for the modification tips, Bill!